In any case, to paraphrase, the video makes a great point about an issue that is affecting millions of white people across America, deadpanned by the great Jason Alexander. What’s interesting, however, is that my boyfriend and I have discussed this issue at length, with the most recent stint occurring last night before dinner; in this way, we definitely lived up to the stereotype that it’s all “anybody” can talk about – for days at a time. I sat at my computer, reading Netflix’s Facebook Page Wall (that’s a mouthful) and combing through the thousands of messages people have been leaving for them, while Kevin looked through various news articles on his laptop. We sat there comparing notes and tsking and figuratively shaking our fists in the air at this nonsense. The bottom line is, people are outraged that Netflix is jacking up the price by 60% without discussing it with their millions of loyal customers first. I’m a little torn because I can see both the company’s perspective and the one of being the huffy consumer. (Aside: one woman wrote a scathing comment on the Netflix FB Page and several people proceeded to jump on her, making her out to be a screeching, mindless woman who had no right to be upset. It was pretty brutal.) Quite frankly, I just don’t want to have to choose between the discs or streaming. I want to have both! But I am unwilling to pay $15.99 a month for the privilege. It used to be that that price would get you three movies at a time, something which I never had the luxury of affording. I’m a one-at-a-time gal. I do think it would have been nice to have some kind of survey or something sent out, or even a price hike in the range of say, $3.00, to continue enjoying new movies on DVD and streaming older (sometimes crappy) movies and lots of television shows. We don’t stream on more than one device at a time but many have left since Netflix has begun enforcing its streaming policy. Apparently Netflix only wants to allow you to stream on the same basis of how many discs you take out at a time, which really negates “Unlimited” streaming but also, what happens when you go to the all streaming plan? I was thinking about how electronic subscriptions differ from say, magazine subscriptions. Netflix caught on to the fact that people were sharing their log-on information with family/friends and so to keep people from “stealing,” they are cracking down on multiple device streaming. Granted, I don’t own or run a billion dollar company, but if I have a subscription to Vogue and I give all my copies to a friend to read when I’m done, how is this different? Is that person “stealing,” too? Is this really a problem for Netflix when they have ousted a lot of its competition (namely, physical DVD rental places) and they are highly profitable? The only other troublesome thing is that I think many people would have stayed on if Netflix had newer releases available to stream, at least, instead of the B movies of yesteryear. Granted, I have loved catching up on some older television shows, but when I want to watch something new that came out that I was unable to see in the movie theater, I believe I should be able to do that if I am paying a monthly subscription fee. RedBox has gone through the roof with new customers. Blockbuster immediately set up a plan to soothe the wounded from Netflix. 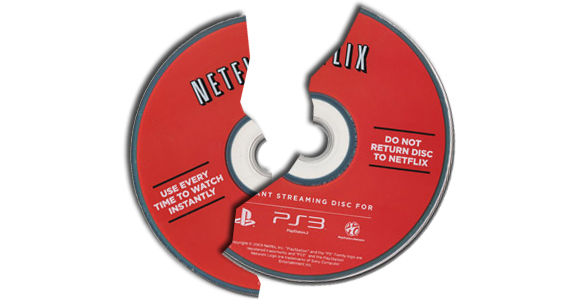 They offer hard disc rentals, streaming, games, and even Blu-Ray discs at no extra charge and are offering a 30-day free trial to the scorned. Check out all the details here. I don’t want to like Blockbuster. They used to charge $4.99 to rent a DVD for two nights. I can’t even say how much money my parents and myself spent in the 90s and early 2000s renting movies and games from them. Netflix was the solution! But this latest blow does give me cause to reconsider my options. While I believe I will probably try out the streaming-only plan come September, I can’t guarantee I won’t jump ship. It’s hard not to think that Netflix only cares about the bottom dollar and now that they have eleven years in to this business, no longer care about Joe American Movie Watcher. I’m on the fence. What will you do?